Now associated as being pioneers of progressive orchestral rock, The Moody Blues had another life between 1964 and 1966, as one of Britain's finest Rhythm and Blues influenced acts. With a line-up of Denny Laine (Guitar, Vocals, Harmonica), Ray Thomas (Vocals, Harmonica, Flute), Mike Pinder (Keyboards, Vocals), Clint Warwick (Bass, Vocals) and Graeme Edge (Drums), the band signed to a London based management company who leased recordings to Decca Records. Their second single, a cover version of Bessie Banks 'Go Now!' was a huge chart success across the world. 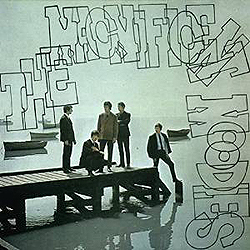 Their debut album, The Magnificent Moodies was released in 1965 to great acclaim and tours with The Beatles eventually led them to become part of Brian Epstein's management stable. 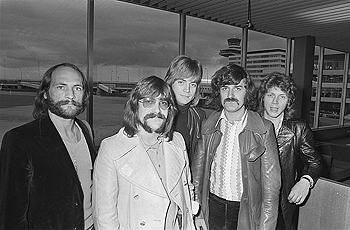 The band continued to record a series of singles, enjoying further chart hits in the UK and Europe, before Clint Warwick departed to be replaced by Rod Clarke and then finally dissolving in the Autumn of 1966 and reinventing themselves stylistically with a new line-up including Justin Hayward and John Lodge. Now in its 50th year, The Moody Blues have officially released a fantastic 50th Anniversary Deluxe Edition 2CD box-set, that includes the original album, re-mastered from the first generation master tapes, along with all the singles the band recorded between 1964 and 1966. Notably this collection includes 29 previously unreleased bonus tracks, including the bands entire Olympic Studio sessions in July of 1964 and the surviving BBC radio sessions from 1965. 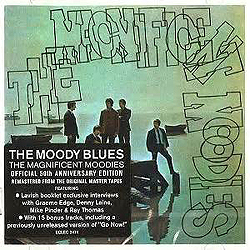 I was recently lucky enough to sit down and chat with original member Ray Thomas, and I first wondered, being that Esoteric Recordings had just released the very first Moody Blues album, the aforementioned The Magnificent Moodies as an official 50th Anniversary Edition 2CD box-set, just what had made the band so "magnificent"?! "Well, what a question! Now, how can I answer that modestly. I mean, isn't it obvious?!! No, actually I think it was either the record company or our Management. 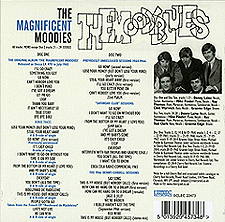 Yes, I think it was definitely Management that decided to call the album The Magnificent Moodies - and who were we to disagree?!" Released in 1965, some 50 years ago now, what do you remember most about those early days putting the album together? "In those days you weren't given weeks, or even days, of studio time - just hours, really. So, the album was basically our stage act; we just recorded the songs that we'd already been performing on the road. After all, they do say that practice makes perfect ... or, indeed, magnificent!!" Indeed, weren't you actually called The Moody Blues Five before it was shortened? "Yes, we were originally called The Moody Blues Five, but we decided it sounded better without the 'Five.' Anyway, we didn't want to confuse the drummer by using a word that he hadn't learnt yet!!" 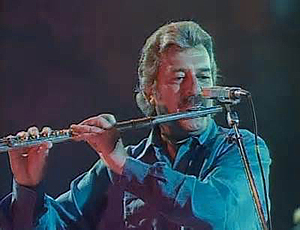 It's been said that The Moody Blues "had another life" between 1964-1966, being that before band members came and went, and the progressive and orchestral rock kicked in, they were one of Britain's foremost Rhythm and Blues-influenced acts. Is that the way you see it also, perhaps? "It's true we did start off playing Rhythm and Blues. After all, we'd spent much of our early years on the road backing artists like Sonny Boy Williamson, but, even while Denny was still in the band, we were moving towards more orchestral-type sounds. That's why when Denny left the band he got himself a string quartet. So we were moving in that direction with the first Moody's incarnation, even before John and Justin joined the band." So, basically, that's why the bands change in musical course came about after the release of The Magnificent Moodies, correct? "Yeh, I mean, to us it wasn't a sudden, conscious change, just a continuing part of our natural musical development." After the album started to garner critical acclaim, and with the second single, a cover of Bessie Banks' 'Go Now!' becoming a huge success, you even toured with The Beatles. What can you recall of those tour dates with them - and if you have any funny stories about touring with The Beatles, please do tell us! "Yeh, we had a lot of fun touring with The Beatles. We used to split up - well, not in that way ... yet! - and half the Moodies would travel in their car and half The Beatles in ours. So, with four-and-a-half people in each car, it was one hell of a tour, as you can imagine!" "Yes, they really were good mates of ours. We knew them well before the tour, because, of course, Brian Epstein was also our Manager for a while. So we were very close ... and, in those days, touring was very different to now. I mean, you played together and you stayed together, and, well, back then, with the fan situation being what it was, we used to have to stay in remote locations - especially when playing around Liverpool." "One night, we were all staying, after the show, at an old country house hotel and John [Lennon] insisted we all meet up for a meal in the hotel ballroom where, over dinner, and under the sparkling light of an early Glitterball, John serenaded us to the accompanying howls of the hotel dog! Johnny and the Moondog, indeed!" Also, reflecting back to the The Magnificent Moodies photo shoot for that album cover, what can you tell us about that day by the water? "Oddly enough, I can't remember much about that particular photo shoot. I really don't know where it was, to be honest, after all this time. Obviously somewhere wet and probably involving midges!!" This brand new 50th Anniversary 2CD box-set now contains a second disc of 29 previously-unreleased different takes, B-sides, the entire July 1964 sessions at Olympic Studios in London, and so much more! So where have these recordings been hiding - or have they always been tucked away just waiting for this 50th Anniversary day to come?! "Some of these previously unreleased tracks, well, really, I have no idea! You know, we came across them when we were digging through the almost forgotten archives of all the early tapes. I mean, the '23rd Psalm' ... I couldn't remember recording it; neither could Denny and neither could Mike! But, with that sound, it was obviously us. So, uh, there we go. It's an awful long time ago, 50 years, so we can't really expect to remember that much, or not a lot of it! "If you were there, you can't remember it." Well, at least I think that we remember we were there!! Weren't we ...??" At this stage, your guess is as good as mine, my friend, sorry! Anyway, after the release of the album, and the fact that the remaining singles released didn't do as well as 'Go Now! ', both Denny Laine and Clint Warwick left the band and were subsequently replaced by both Justin Hayward and John Lodge. This paved the way for The Moody Blues as we know them today. But why were things so bad just two years into the band, and with a generally-accepted-to-be successful debut album under your belts, that the band had to dissolve like that? "Well, bands are complicated things. It's probably better to ask how they've stayed together, if they have, rather than how they fell apart! On the whole, they're just like real people. So, you're all walking the same road together and then one says, "It looks really interesting over there. I'm gonna take the next turning," and another says, "I really like it here. I think I'll stay put," and you say, "I'm happy going on in this direction." That's what happens, isn't it? Anyway, back to the point! So, Denny wanted to pursue a solo career and Clint didn't want to tour at all anymore and went back to running the family business in Birmingham. Well, Mike and I wanted to go on, so it was up to us to find, well, a John and a Justin - which we did, fortunately." Going back to those Olympic Studio sessions in July of 1964 produced by Alex Murray, what are your memories of that recording session? "To be honest, though I obviously remember Alex Murray and know Olympic Studios, I can't recall that particular recording session. However,in my defence, it was 1964! I suppose I could always make something up, but I won't." Maybe we'll have better luck with this flashback: What are your memories of the also-included surviving BBC radio sessions from 1965? "Ummmmm ... it feels like we were in the BBC studios all the time recording a whole variety of radio programmes, but, basically, for most of the programmes we were playing on an actual stage, you see, with a live audience. Later on it was usually a studio session - just the band, a BBC Engineer and BBC Producer who, very often, were not, how shall put it, overly familiar with Rock 'n Roll. But, at that time, it was a real live performance and one take was all you got." As we're not called Exclusive Magazine for nothing, please reveal something "juicy" about your time spent in The Moody Blues that you, hopefully, have never mentioned in an interview before! "We used to squeeze our own oranges! Does that count as "juicy"?" Weirdly, it does! With 'Go Now!' having been #1 some 50 years ago now, well, just where has the time gone? "Yes, where has all the time gone? and where is it still going? God knows. Only God knows. We had a ball and, truth be told, we're still having a ball." You seem to be quite active on Twitter, so would you say that you have mastered Social Media these days? "I do hope you're not calling me a twit?! I don't know anything at all about this - my wife looks after all that computerised stuff. I haven't got a clue, not a clue. I couldn't even turn a computer on!" Fair enough! I know you are in and out of recording studios, so will there be new music from you anytime soon, perhaps? "Yeah, as you say, I'm in and out of the studio. I do work for all kinds of different bands, recording-wise, and, hopefully, I'm going to record a new album this coming year. I've got one or two tracks already." And why the flute? Out of all the other instruments in the world, why did that one take the eye of a young Ray? 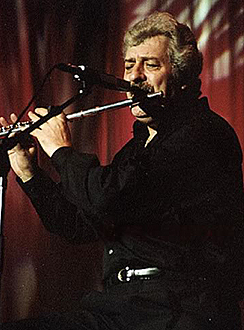 "I've been asked this question so many times: Why the flute, out of all the instruments in the world? Uh ... well ... they're small and easy to carry around and especially easy on your roadie! But seriously, there was the fact that when we were using the Mellotron, the flute and the Mellotron string patches blended beautifully to create. Well, it was just so classical, so orchestral, really, and, at that time, so new." Sadly, in late 2013, you were diagnosed with prostate cancer, but instead of hiding behind it, you have brought it out into the public eye to draw attention to it so that people know there are treatment options available. Was the late, great Alvin Stardust's passing of the same cancer the catalyst for your decision? "Initially, when I was diagnosed with prostate cancer, I didn't announce it in public. I felt it was quite a private matter to learn to deal with, but, then, when Alvin Stardust passed away with the same type of cancer, I read a very moving and intelligent article by his wife and decided that I should come out with it. Because I now know that it is such an easy thing to detect. Providing us guys just go in for a simple blood test we can save ourselves from, well, death! Let's be frank about it. So that's why I decided to talk about it." Your cancer is in remission after a new treatment was 90% successful, but as you have yourself said before, you will be receiving treatments for the rest of your life. A mixture of both good and bad news, what is one thing that you've awoken to about life because of all this that you, maybe, had previously never paid attention to before? "Yup, the cancer is in remission, which I'm very pleased about, obviously, though the treatment continues with injections every 12 weeks for the rest of my life. But, the alternative's really crap, so I don't have a problem with that! And, well, I've always enjoyed gardening, you know. Growing wonderful, amazing things, but lately I'm really passionate about starting everything from seed. I mean, you get to see it right from its very feeble beginnings through its fruition to, hopefully, a marvelous and happy life. And, with care, a decent end. Now that IS 'magnificent'!" Finally, we here at Exclusive Magazine LOVE penguins (the birds)! So, we were wondering if you did also, and/or if you had a personal story about one? "Well, obviously, out of respect for your magazine, I dressed up for this interview in a 'Penguin Suit'! However, I can assure your readers that no actual penguins were harmed in the process. Now shut up and throw me a fish!"